Franchising is back in business and the future is looking brighter than ever. But what’s looming and booming for 2014? SmallBizTrends.com tracked the trends for this year to help current and future franchisees make the best business decisions. Their insight can also help franchisors who are seeking to strengthen their business. For a look at what’s shaping the future of franchising, check out the following franchise trends. The trend toward customization has touched many industries, but now it’s a focus for franchises as specialized business come to the forefront. Expect to see many more highly specialized franchise opportunities that feature products and services for certain niches. A prime example is Brain Balance Achievement Centers, which offers programs for children that deal with the underlying issues resulting from the behavioral, developmental, and learning disorders they face. Another is Mosquito Squad, which is a pest extermination business whose focus is fighting outdoor pests. Others include a financial firm that helps franchisees improve their cash flow, as well as a franchise that offers high-end moving and storage solutions, and a fitness franchise for boxing and martial arts workouts. One of the biggest trends in food franchises is self-serve. The greatest growth has been seen in the frozen dessert segment with self-serve frozen yogurt franchises. These fro-yo chains let customers create their own treats from a rotating array of flavors and toppings and then pay for their final creations by weight. Now, the newest segment in self-serve food franchising is healthy vending machines. While vending machines have always been self-serve, they have typically always been filled with unhealthy foods. But the obesity problem and our general focus on healthier eating have led to a craving for better choices. And that hunger is being satisfied by firms like Fresh Healthy Vending, which has more than 200 franchisees filling more than 2,000 vending machines with healthy snacks. The company is further specializing their vending vision by marketing to military bases where the highly active community strives to stay in shape. The vending trend also extends to franchises selling other types of specialized machines. Human Healthy Vending makes machines that only offer coffee, fresh fruit, or locally sourced products. They also make versions with 23-inch LCD video monitors for streaming ads, which offers additional revenue opportunities. Mobile is already mainstream, but it’s picking up more steam in 2014. Today’s franchisees must be able to access their business at any place and at any time, and only mobile makes this possible. And the mobile momentum affects franchisors by making them responsible for optimizing their corporate websites for all kinds of digital devices. Today, most people use mobile devices for both business and pleasure. That’s why websites must be mobile-friendly to ensure that future clients, current customers, and prospective franchisees can easily view a franchise online and remain engaged long enough to take real action. There’s now an abundance of mobile technology to help franchisees capitalize on every opportunity. As a result, franchisors need to invest in the kind of mobile technology that makes franchisees more productive and profitable. This includes the Click-to-Call website feature, which has become increasingly popular with consumers on the go, as well as Point of Sale (POS) systems that accept payments from their mobile devices. In addition, McDonald’s is testing a smartphone app that scans a special QR code when customers visit a location and then activates a virtual “scratch card” that reveals discounts and deals. Since franchisees are the people who have invested their own money to be their own bosses, many are making their voices heard and opinions known. And they’re making a major difference in the ways and workings of franchising. One of the largest and loudest groups is McDonald’s franchise owners. They may have a powerful brand behind them, but many are mad about bad policies. Last year, some of them joined forces and formally complained to corporate about rising franchise fees, shrinking earnings, and lack of profit from Dollar Menu items. Their protest led to progress because the Dollar Menu has disappeared. If current franchisees are vocal, wronged ex-franchisees are vehement. Most aren’t seeking change, but are trying to recoup their losses and prevent others from making the same mistakes. And they’re using the ease of social media to share their own bad experiences. They are also using watchdog websites like Rip-Off Report and UnhappyFranchisee.com to speak out, share information, and fight back against bad business practices. It’s important for prospective franchisees to see these complaints as part of their research, but need to consult all parties involved to hear the entire story. Prospects should also talk to current franchisees who deal with the business every day to discover the daily details. 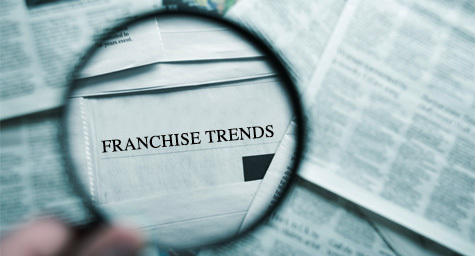 Hopefully, these franchising trends will lead current and future franchisees toward worthwhile opportunities and help franchisors better their businesses in ways that pay off for everyone. See what’s fresh in franchise marketing. Contact MDG Advertising today at 561-338-7797 or visit mdgadvertising.com. MDG Advertising, a full-service advertising agency with offices in Boca Raton and New York, NY, is one of Florida’s top branding firms. MDG’s capabilities include print advertising, direct mail marketing, branding, logo design, creative, digital marketing, franchise marketing, media buying and planning, radio and TV advertising, Web design and development, online video advertising, email marketing, content marketing, social media marketing, and SEO. To learn about the latest trends in advertising and branding, contact MDG Advertising today at 561-338-7797 or visit mdgadvertising.com.